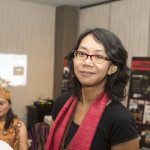 Mina Setra is Deputy Secretary General of The Indigenous Peoples’ Alliance of the Archipelagos (AMAN). She is a Dayak Pompakng from West Kalimantan, Indonesia. She has worked with AMAN since its establishment in 1999, predominantly in international policy and advocacy. Previously, as Deputy Secretary General of Policy Advocacy, Legal and Politics, Ms. Setra worked on ensuring the rights of indigenous peoples in the implementation of the REDD program in Indonesia. She also oversaw the submission on the Forestry Law to the Constitutional Court, which led to the Court’s historic ruling that customary forests no longer belong to the state. Prior to joining the national Executive board of AMAN, she was the Secretary General of AMAN, West Kalimantan. Ms. Setra is also a founder and board member of the West Kalimantan based Ruai TV, a community television station for indigenous and marginalized communities.